Would you like to teach your children the meaning of money? Perhaps you would like them to be prepared for the future so they are able to manage their money easily. Here are some tips to help you along! How do I teach my children the meaning of money ? Whilst your children are still small they do not have any idea on what money is or the notion behind it. If you are in a shop and they ask you to buy them a toy you may answer that it is too expensive. The concept of something being too expensive however will not mean a lot to them. This is quite normal; why should it be any other way. ♦ Take 20 marbles and explain to your child that the marbles represent the money that you earn working. ♦ Remove some of the marbles for each type of spend; for example 5 marbles represent the rent spent on the house, 3 marbles represent the food shop, 2 marbles represent petrol and so on. ♦ At the end of the exercise there should only be a few marbles left. Explain that the marbles represent what you have left at the end of the month. You could then explain that you prefer to save what is left rather than spend it immediately, to then use later on (for example a family holiday or a new car). This exercise is useful as it helps in creating a more concrete image and meaning as to what money is for a child. It helps in explaining that we cannot spend more than what we actually have and always buy everything, which hopefully helps when reasoning with your children in situations involving money. It can be a good idea to give pocket money to your children and generally it is advised that it should be given from the age of 6 once the child knows how to count. For example give an amount of 1€ a week and explain that it can be spent straight away on a few sweets for example or saved until he or she has enough for the toy they have dreamed of for a long time. From then on your child can learn to save even if it is a small amount per week. This will help for the future when it comes to saving bigger amounts. 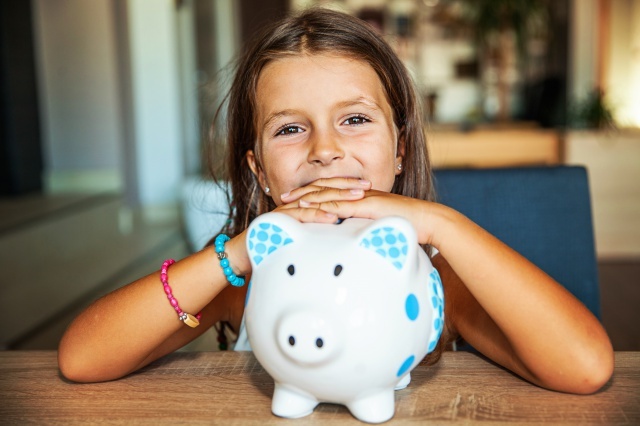 If you would like to open an account for you children and save on their behalf click here to see the options available.